Twenty six cuddly ABC Monsters live within the walls of Capital Castle. Each monster represents a letter of the alphabet, but should any of the monsters go missing for longer than a day, all the letters will be wiped clean from every book in Capital Town! 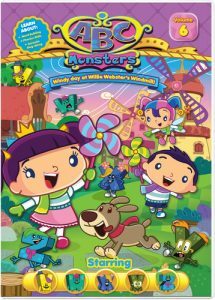 In this DVD, embark on adventures with Alice, Brian, and Cherry Berry to search high and low for the letters V, W, X, Y, and Z. It’s a very windy day in Capital Town. After checking the ABC Monsters, it seems that one of them is missing – W-Monster! So Alice, Brian and Cherry Berry head into town in hopes of finding their missing friend, W-Monster. Along the way they meet, Wanda the Weaver, Wendy the Window Cleaner and then Willie Webster. Hopefully, one of them will be able to help Alice, Brian and Cherry Berry find W-Monster during this windy day. Get set for a spellbinding series of magical adventures that engages preschool children’s imaginations, while making learning exciting and entertaining. KIDS FIRST! Film Critic Jolleen M. comments, “This educational DVD is super cute and hilarious. I love that it is interactive and that there is music. The animation is very colorful, bright and vivid.” Sahiba K. adds, “My favorite part is the journey of finding the monsters because, even I had the pleasure of guessing the riddles and seeing how one puzzle would lead to the next. The message of this DVD is “always help those in need and good will always transpire.” See their full reviews below. This educational DVD is super cute and hilarious. I love that it is interactive and that there is music. The animation is very colorful, bright and vivid. In the story, the letters of the alphabet are all different monsters. 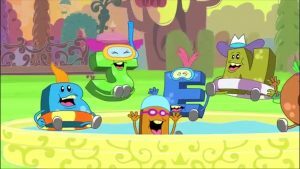 Each episode stars one of the letters of the alphabet. Later in the episode, the letter goes missing and it’s up to Alice, Brian and Cherry Berry to find the missing letter. If one of the monsters goes missing for more than a day, then all of the letters will be erased from every book. 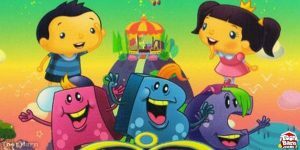 Throughout the episodes, they teach letter recognition, spelling, writing each letter, identifying the missing letter in a word and there are parts where you can sing-along. I like the style of animation in this show. It is really cute, cheerful, colorful and pleasing. The animation flows well and has lots of detail. The backgrounds look really cool as well. I love the way the characters’ faces have different expressions and they show a variety of emotions through their facial expressions. Each of the characters has a different hairstyle and different personality. This shows me that the creators took the time and the effort to give each character a completely different and unique look as well as a completely distinctive personality. It makes the DVD just that much more interesting to watch and it impacts the storyline as well. My favorite part of the episodes is when they can make alliterations with the letter that is starring. It is really creative and amazing to see how many words they come up with. For example, on the episode that stars the letter W, they met Wanda the Weaver, Wendy the Window Cleaner and Willie the Webster. The message of this DVD is about teaching kids to do the right things when different situations arise. The goal is to educate kids about the alphabet and help them develop their language skills. The film also has sing-alongs, which can help in developing your reading skills. This show excels at teaching while entertaining kids. I believe that a child can learn a lot about the alphabet from watching it. I give this DVD 5 out of 5 stars and recommend it for ages 4 to 7. It is available on DVD now so go check it out. 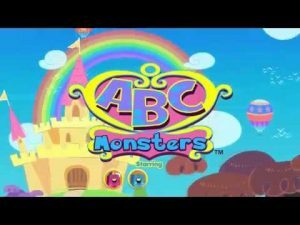 ABC Mon sters Starring VWXYZ, directed by Ah Loong, is an interactive adventure full of fun and games! 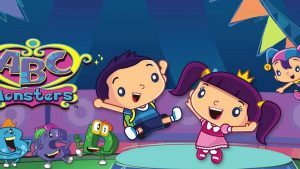 Songs, puzzles and dances encircle each episode with excitement. Puzzles where viewers are asked to help kept me engaged as I felt I was a part of the show, helping the main characters along their journey to find the missing monsters. The story follows Alice, Brian and their fairy Cherry Berry, who embark on different adventures to find the missing letters. On their way, they face many puzzles, meet new friends and visit new places. They even learn new songs and dance moves as they embark on their exhilarating quests. The animation and songs are unforgettable. The children and adults have a larger head than body, which allows an exaggeration of emotions. It makes it easy to understand what the characters are feeling. The monsters come in different colors, have distinctive hairstyles and unique personalities. Each characteristic adds to their charm including their smiles and even their unique teeth. The backgrounds are colorful and radiant. They appear to have been drawn as there are sketchy lines that outline the trees, hills and houses. This adds to the calm feeling of watching different, lively scenes. The animation becomes more visually appealing when different patches of designs merge to create walls, floors and hills. It prevents certain areas from being one solid color and gave me more to look at on their adventures. When a song begins, the scene changes into vibrant shades of yellow, pink and blue with a multitude of flowery shapes. The characters dance on screen while colors and patterns flow past them. There are sparkles everywhere and lights flash as if the characters are at a disco. Captions also appear at the bottom, encouraging viewers to sing along. The ambience of these scenes are exuberant and energetic. The songs themselves are catchy and made me want to sing along too. My favorite part is the journey of finding the monsters because, even I had the pleasure of guessing the riddles and seeing how one puzzle would lead to the next. The message of this DVD is “always help those in need and good will always transpire.” I give this DVD 4.5 out of 5 stars and recommend it for ages 2 to 6. This DVD is available now so be sure to check it out, especially if you have pre-schoolers. Oh no, W-Monster is missing! Capital Castle is a grand place that houses the 26 Alphabet Monsters, but today we have one missing and we must find it! My son was loving the search and kept asking where W had gone. It is adorable. My favorite thing about this DVD is the alliteration and how it coincides with the main cast. For example: since we are searching for W, we encounter Willie Webster and Wanda the Weaver and all this takes place on a windy day! Isn’t that fun? One of the children searching for W-Monster is named Alice and she is such a sweetheart. I love seeing such a positive portrayal of little girls on screen. All of the Alphabet Monsters are funny and somehow manage to have different personalities. This show provides fun adventures, but I honestly just love the fact that these 26 monsters have 26 distinct looks and 26 distinct personalities. It’s wonderfully done. This is best for preschool aged children, however, I recommend it for ages 2 to 6 and give it 5 out of 5 stars. This entry was posted on Thursday, November 9th, 2017 at 3:06 pm and is filed under DVDs Released. You can follow any responses to this entry through the RSS 2.0 feed. Both comments and pings are currently closed.